It has been a few days since my last blog.....had trouble with our telephone line, which meant our broadband stopped working but after a few days of engineers coming to the house and working at the exchange, we are at last up and running. Here is my first Promarker coloured in stamped image, I am quite pleased with this card. I mentioned to a club member friend -Sue, that I had never managed to stamp an image and then colour it in, without it looking flat. Sue very kindly said she would teach me how. 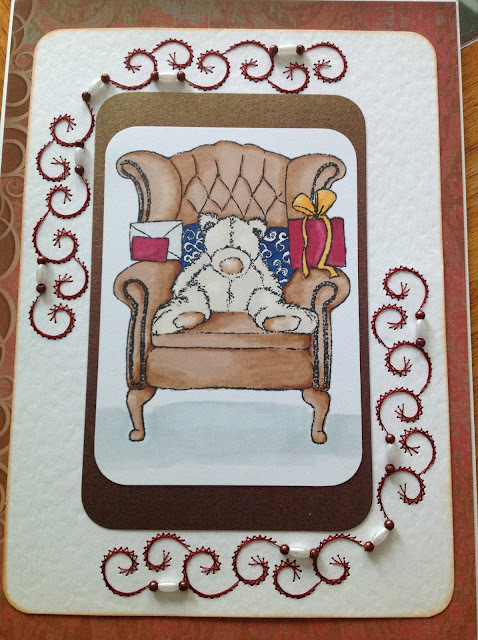 So the following week I stamped this image of the teddy in the chair, and Sue showed me how to colour the image without it looking flat. Sue taught me how to shade and blend, and when I had finished the picture, I was quite pleased with the end result. I stitched the pattern using a dark red colour thread (which highlighted the present and envelope in the picture), and white and dark red beads. I then matted and layered the picture onto the stitch card and then mounted onto some hunkydory card I had. It doesn't take much to make me happy....hoping to stamp and colour more images.